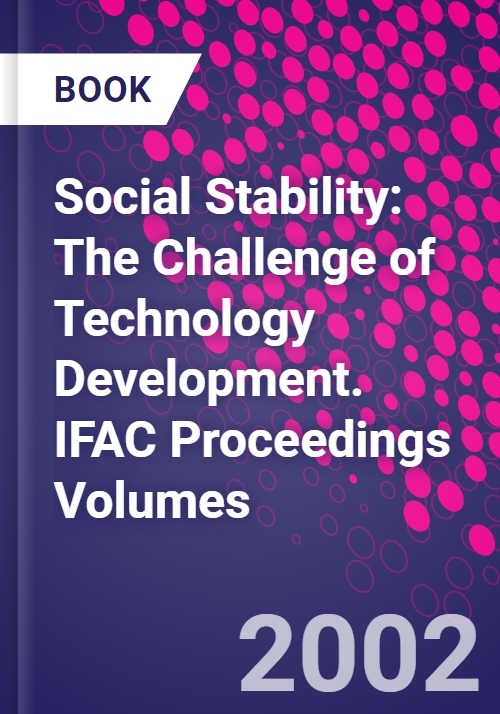 This Proceedings contains the papers presented at the eighth in IFAC's conference series on Supplementary Ways for Improving International Stability. This conference, entitled "Social Stability: The Challenge of Technology Development", was held in Vienna, Austria, on 27-29 September 2001. The papers included in this Proceedings volume cover a very broad field of interest, and include topics such as social aspects of technology transfer, managing the introduction of technological change, ethical aspects, technology and environmental stability and anticipating secondary and tertiary effects of technological development. Technological development has caused profound changes to social stability. Regions that had stable populations for centuries have experienced enormous population growth, leading to the formation of sometimes unmanageable megaplex cities, as well as bringing about macroscopic environmental change. The papers in this Proceedings offer insights into ways to mitigate the unwanted side-effects of rapid development, and methodologies for appropriate ways of managing the introduction of technologies which will alter social stability. This conference was dedicated to Professor Harold Chestnut, the first president of IFAC, who died in August 2001. Professor Chestnut was among the pioneers of social stability ideas within IFAC and formed the technical committee which organises this conference series. Survey paper. Invited plenary paper. Managing the introduction of technological change. Technology transfer and social change. Social and ethical aspects of technology transfer. Technology and environmental stability. Various.